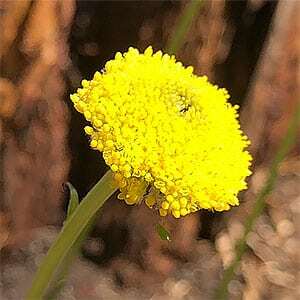 Yellow button like flowers on tall stems give Craspedia variabilis the common name of Billy Buttons. This is a tufted perennial which is very attractive when in flower. These attractive little plants are related to daisies, they perform best in full sun to a little shade and will grow well in containers. The are a plant that grow in hollows and other areas that retain some moisture over summer. So good drainage, however some moisture is required. 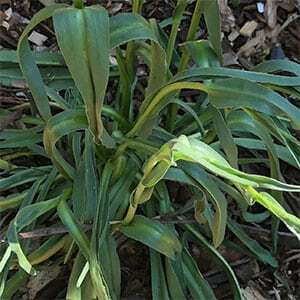 They will die back to underground rhizomes at the end of summer to reappear in spring. A little light mulch of perhaps surrounding the clump with small stones or gravel can help maintain the cool moist root run that Billy Buttons thieves on. In a reasonable humus rich soil little to no fertiliser will be required. Easy from seed sown directly to the garden or started in containers if needed. Seeds are surface sown and kept moist. Seeds should germinate in around 2 weeks if sown in spring. Spread – To around .2metres. Flowers – Yellow and rounded.